We have a new dog in the house this week, and in a case of impeccable timing, our food sponsor, Natural Balance, surprised us with a shipment of something new to try: Original Ultra chicken, chicken meal, & duck meal formula kibble. Our pack has thrived on Natural Balance food and treats for years now: their variety allows us to work around food allergies in our Labs, and their higher fat/protein formulas are terrific for our Greyhound athletes. Our challenge is that we have finicky eaters – specifically our Lab ladies. They are our pack elders, and have sampled more than 30 food varieties over the years. They bore easily and only tend to stay with flavorful foods – a number of brands have been summarily dismissed by them, spit our and rejected. Not so in this case. We’re watching this bag deplete at a rate much faster than normal. The cold weather has moved in and in their typical fashion, the Labs are packing on a couple of pounds of insulation for the winter (we feed freely in Sola’s case) and loving Original Ultra with every crunch. If these picky pooches give it their stamp of approval, chances are that your dog will love it as well. 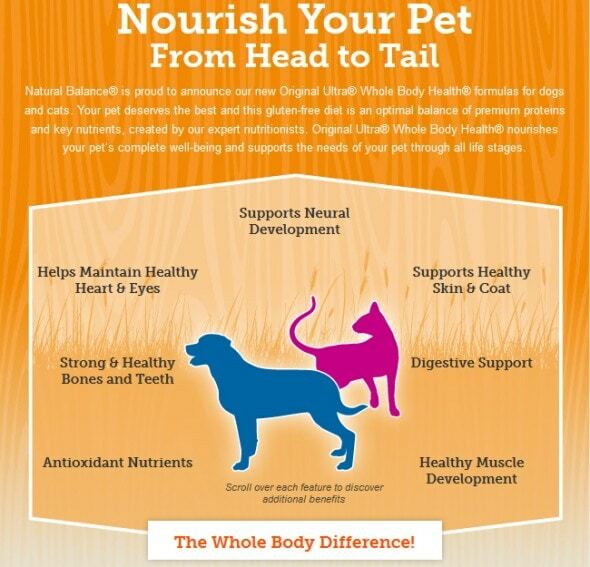 And you’ll love knowing that your dog is eating a balanced, complete, healthy diet. • Supports Neural Development: Formulated with optimal levels of DHA & EPA from marine sources to support an active, healthy brain. • Strong & Healthy Bones and Teeth: Proper levels of calcium and phosphorus maintain strong bones for all that fetching and playing. • Helps Maintain Healthy Heart & Eyes: Added taurine for healthy heart and eye function. • Antioxidant Nutrients: Our proprietary blend of antioxidant nutrients helps maintain a healthy immune system. • Supports Healthy Skin & Coat: Balanced Omega-6 and Omega-3 ratios support healthy skin and a luxurious coat. • Digestive Support: Using multiple types of fibers-fruits and grains- our unique fiber layering system helps maintain healthy digestion. • Healthy Muscle Development: Quality proteins to help support healthy muscle, important at any age.